Often, our life seems like a dream, not reality. Everything you hear, see, feel and smell is covered in an unreal fog from where you, as the observer, wonder who built all of this. And why? You wonder about the true function of your brain. Is it the logistic center of your body or is it a device that filters the reality as it is into something we can understand and live with? Is life simply a process in which we as individuals have to try to cope with all the possible problems of our common evolution? I'm drifting off a bit, I know, but that's one of the major functions of decent music - and for me it's exactly what defines quality in music; being able to drift off and let your imagination work with the input coming from the speakers. When the music is good enough, it has that power, especially the so-called 'imaginary landscapes' genres like ambient and post-rock. 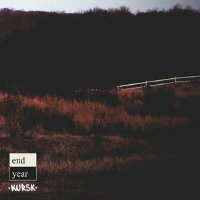 Kursk by End Year is one of those albums that have the ability to send your imagination on a journey. End Year is an instrumental four-piece from Woodbridge, VA (USA). Kursk is their first output. There are six songs on this album, lasting a bit under thirty minutes. If you play the album on repeat, you can easily listen to hours of excellent post-rock with only these six songs. Their build-up, atmosphere and apotheosis are basically similar. This results in something that can be seen as a concept-cd with a beautiful natural flow in the track order. It's clear that End Year has been listening to most of the big post-rock bands like Explosions In The Sky, Mogwai or God Is An Astronaut. The shifts between dreamy and heavy passages are somewhat predictable but that doesn't make Kursk a bad album, on the contrary. Kurks sounds very familiar, very warm and welcoming. End Year could be making a proper impact if they get the exposure this music deserves. Actually I accidentally stumbled on this album and I immediatly loved it. Besides, Kursk is available as a pay-what-you-want download through their bandcamp page. As far as I'm concerned, End Year are well on their way to signing a deal with a respected label and go on an extensive tour with this material. Perhaps it would be some good advice to download the album as soon as possible because soon End Year could be a force to be reckoned with.